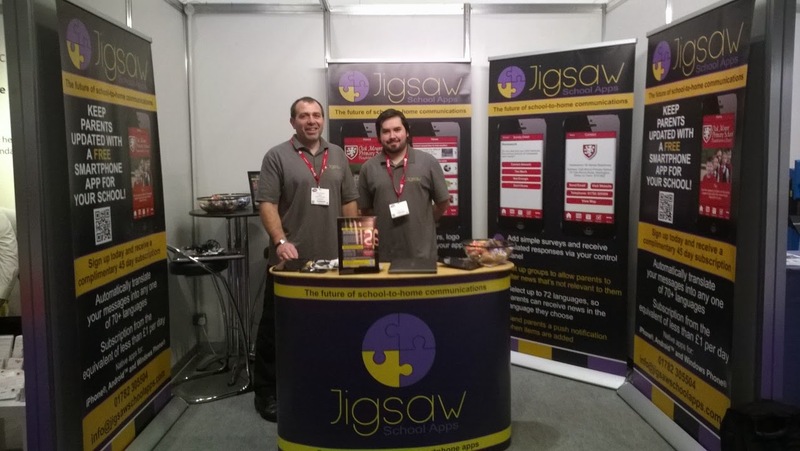 We are back from a great few days at the ExCel Centre in London's Docklands at the Bett Show 2014. To be honest I wasn't sure if I was going to enjoy it. 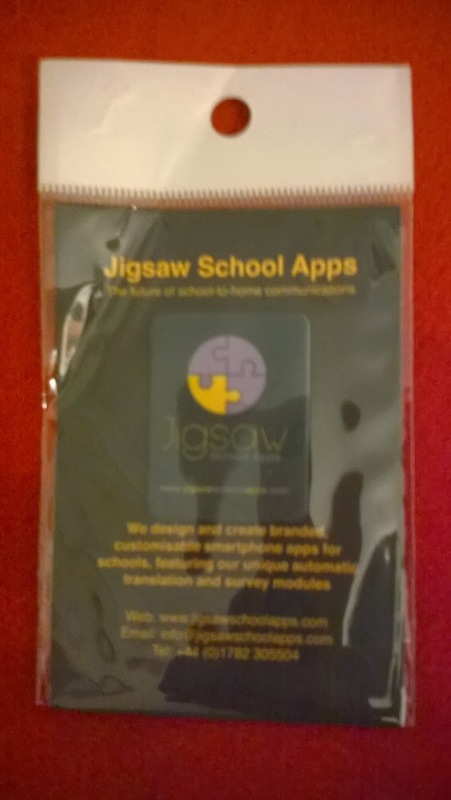 Four days of handing out leaflets and encouraging people to have a demo of the Jigsaw School Apps sounded a bit daunting for a shy librarian like myself :-) Also, sounded like hard work too! However, I absolutely LOVED it! I met some really nice, interesting people and everyone was so lovely. Yes - our feet did hurt after four long days but it was totally worth it! I was very proud of my "sales executive" badge. We stayed in the Ibis hotel near London City Airport so that we could walk into the ExCel each morning. Then in the evening we just about managed to hobble to the pub in between (the excellent Fox @ Connaught) for food and a reviving drink before hobbling back to the hotel for an early night, so we'd be ready for the next day! Nathan and his business partner Darren had gone down lunchtime on the Tuesday - so that they could set up the stand the day before it started. I met them that evening after I had finished work and caught the train down. I said "Okay - what is the plan for tomorrow then?" and they said "No plan - we'll just wing it!" 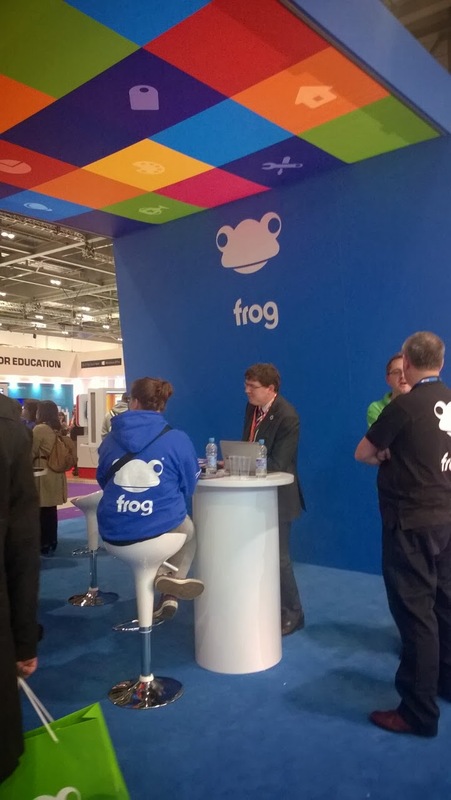 It was the first time they had exhibited at such a show, In fact, none of us had been to the Bett Show before. We had no idea what to expect. They were a little worried by the size and showiness of some of the other huge stands. I think we felt we would be sad and ignored up the corner. 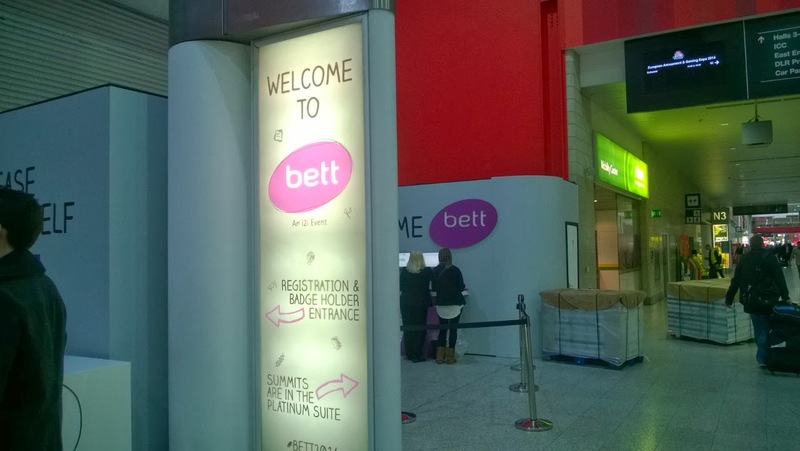 However, we nervously paced up and down the carpet as we waited for the Bett lady to announce that Bett 2014 was open at 10am on the Wednesday. Before long there were people walking towards us. It started a little hesitantly but soon there were many visitors to the stand. I discovered that if you didn't make eye contact and give them a leaflet they wouldn't necessarily stop. But as soon as they realised what they were doing - they were happy to have a demo of how great their apps could look and how easy it was to put content into the apps from the web-based control panel. Nathan and Darren were great at giving demos - so enthusiastic and funny. They know the products inside out as this whole concept is their baby. It really shows that they care about getting everything perfect. 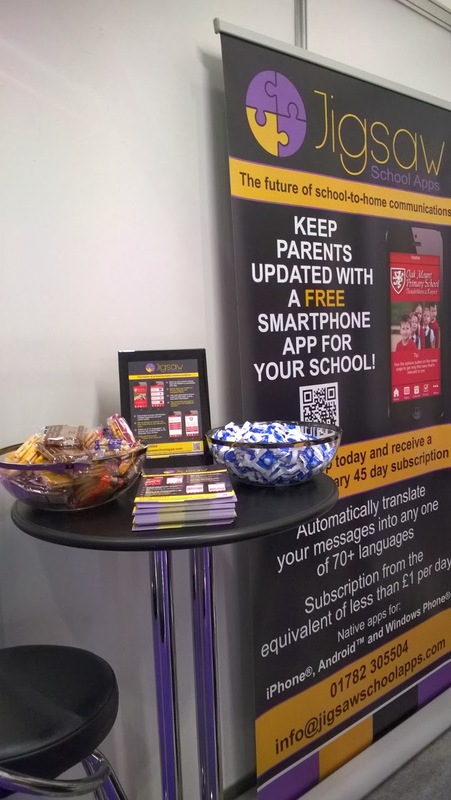 So many people were impressed - especially with the new feature they were launching - the translation service. It means that parents can download the app for free from their app store (and they are the only ones to include Windows phones as well) and then choose what language they would like to read the content in. Many schools have parents who do not have English as their first language and we stressed how important parent engagement was. Also the survey feature means that schools can get instant feedback from parents - another thing Ofsted are very keen on. Okay - bring it on! Friday was the busiest day and at one point there were queues waiting for demos! I got so used to saying "Are you interested in school apps? School to home communication?" Quite often someone would say no, then take a leaflet , start reading it- then back up and say "Actually yes we are! We were discussing this last week"
I said to one lady - "Would you like to come back later when they are not so busy?" but she said "No, I'll wait here until they are free!" It was lovely to see so much interest - after the months of hard work they have put into this. What we didn't realise was that there would be so many visitors from overseas. We had a member of the government of Trinidad and Tobago - responsible for 50 English-speaking schools, who was enthusiastic about the idea. A man with an awesome beard from Egypt and two principals from the International School in Vienna. All left their contacts so that we could send them more details. Altogether by the end of the show they had over 250 contact details from people who were really interested. Not bad for a tiny stand in a huge hall! 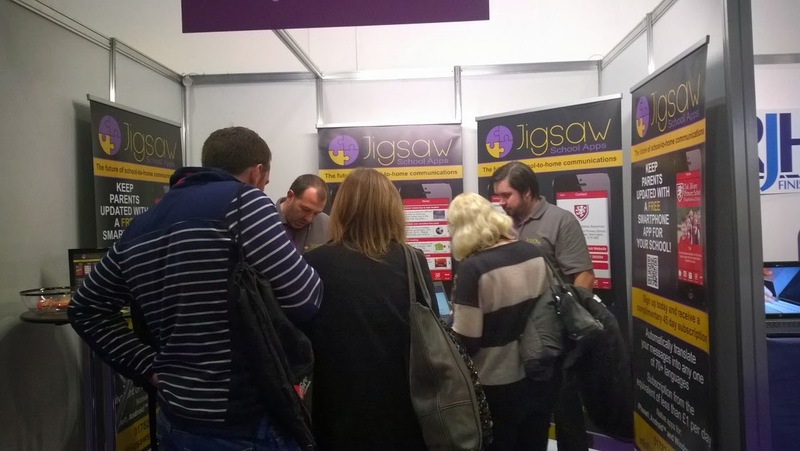 We were ecstatic to see that we had far more visitors than the big shiny stand opposite. They had a staff of around 10 who were constantly on their phones looking bored! We had a staff of three - although we had four on the Thursday and Friday when Darren's lovely wife Jo came down to help them out. It was nice to have two of us handing out leaflets - they had to give twice as many demos! It also meant we could go for more breaks to have a sit down. You could see the exhibitors in the food hall - the ones who looked in pain as they walked or stood in the food queues! We'll have to see how many of these contacts turn into orders. We gave out almost 2500 leaflets too. As well as schools they also had interest and offers from other companies who want to work with them. - who were also exhibiting. They have lots to think about in the next few weeks. Lots of others were giving away pens - but the most prolific free gift were the lovely frog bags - they were shiny and big and colourful and had a frog on them. I didn't see anyone without one or two! Not sure what Frog do though! So, after four fun, exciting, busy and tiring days we had to dismantle the stand and get out of the ExCel Hall in half an hour. That's when they started pulling the carpets up to allow the lorries and fork lift trucks in to dismantle and move the bigger stands. It was so great that when we got back home Nthan and Darren signed up to go to the Education Innovation Conference 2014 in Manchester on 27th and 28th of February. I enjoyed this so much I've booked two more days holiday so I can go along and hand out leaflets again! 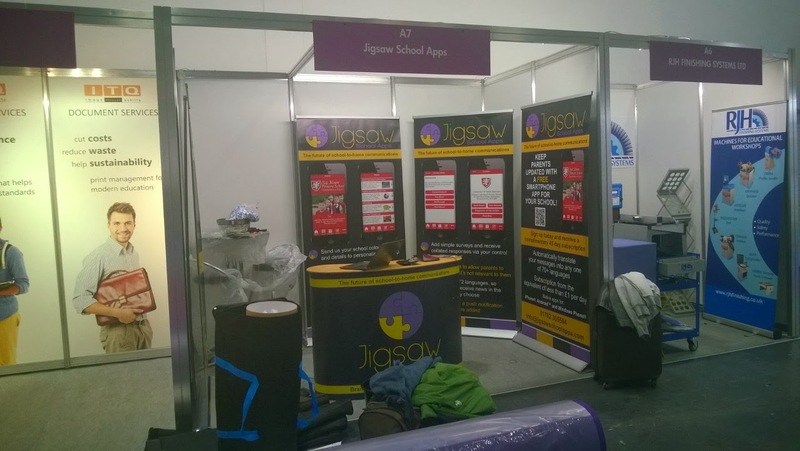 BETT 2014 - here we come! This will be the first time I will have been to a trade exhibition as an exhibitor (well assistant to exhibitors!) and it will be an interesting experience I'm sure! 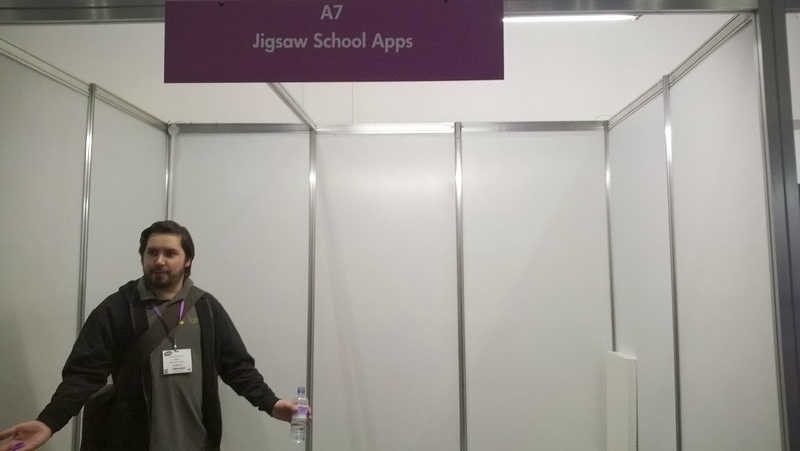 It is the first time for JIGSAW SCHOOL APPS too. 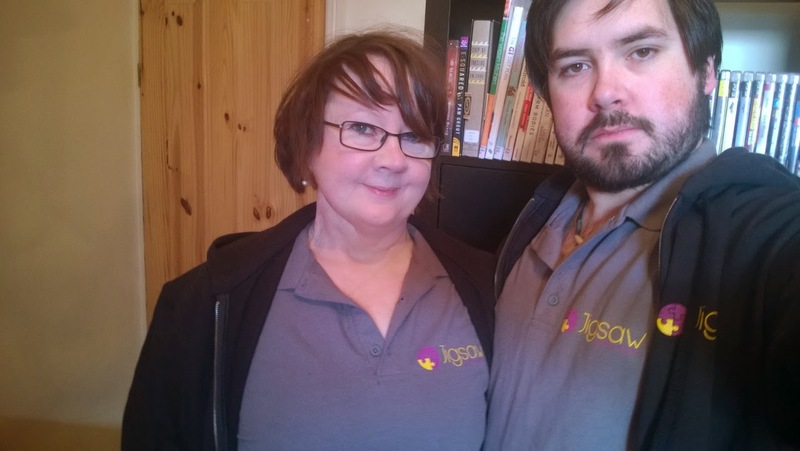 This week we have picked up the matching branded polo shirts and hoodies - for us all to wear on the stand. 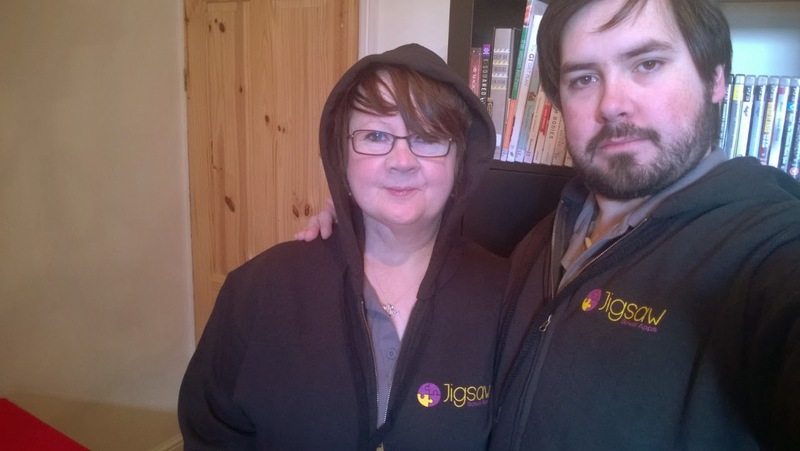 They have come out pretty well and I especially love the hoodie! Nathan and Darren are going down to London Tuesday lunchtime - so that they can get to ExCel in time to set up the stand before Wednesday when it is opened at 10am by Michael Gove. I think it is going to be hard work - over four long days - but fun! It's nice to met new people. Something surprising happened that did actually take me aback this week - which really shows how competitive this industry must be at events like this. He said "We did this last year and people had a good time. 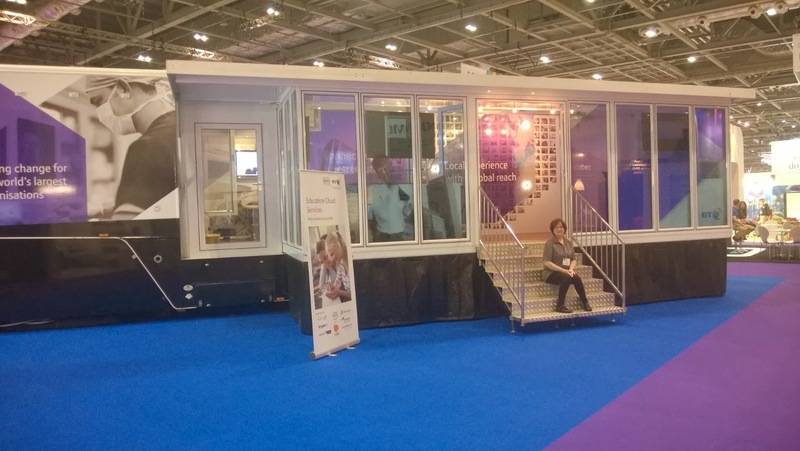 We have been employed by a local technology company to provide extras pretending to be teachers to sit and watch presentations for the day at the BETT show...They just need people to sit and listen so it makes their stand look busy. It would be for one day and will pay £100. Let us know which day you can do" They are looking at getting a Megabus to provide transport. Who knew such subterfuge went on?? 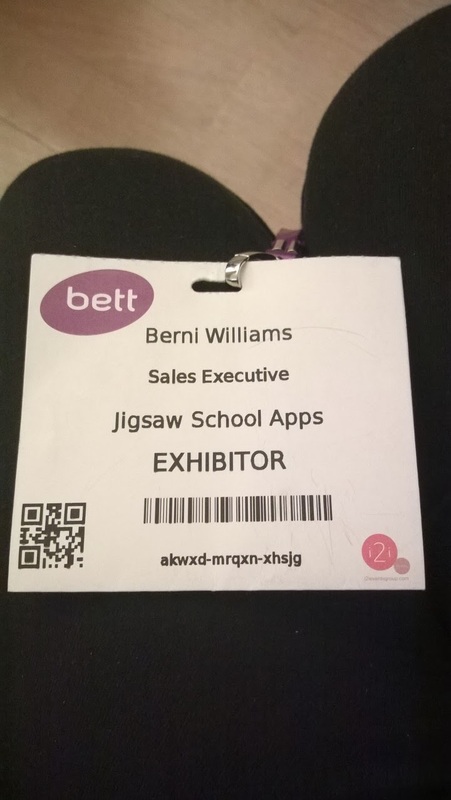 So, not everyone at BETT is actually a teacher - or anything to do with education. I'll have to look out for these imposters! So - wish us luck - and I will report back after Sunday! When we've recovered!! 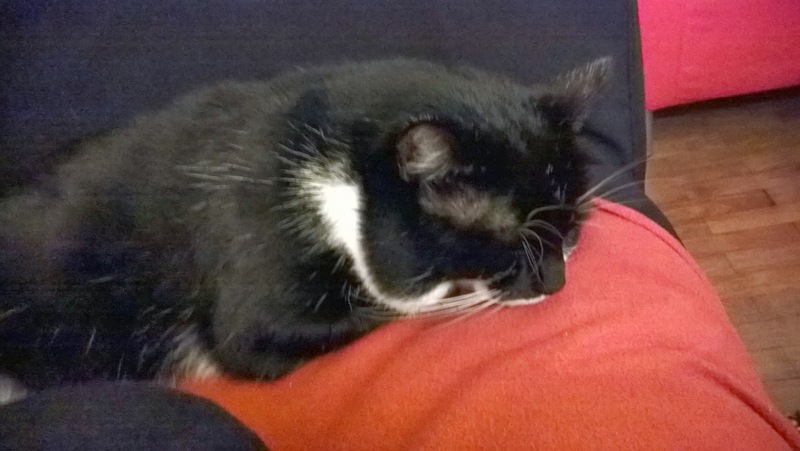 Boodle - completely unconcerned by the New Year. I am a little late getting the blog off to a start in 2014. I have already had my first hospital visit of the year - last Monday. I now go every three months, so it was the routine check-up. I saw a consultant I have never seen before - a Mr Smith. He was very smart and charming and seemed to know all about my case - although he did say "Oh, so it's a year since your Radical Neck Dissection" - when it is actually TWO YEARS since I had my op! I was a little disconcerted when he came at me with the nose camera - I told him Mr Hughes had said last time that there was no point in doing that anymore - due to the adenocarcinoma not likely to be in the mouth or throat. However, he looked so disappointed when he said "Well, you don't have to have it done if you don't want to..." I let him go ahead anyway. I guess it can't do any harm - except make my eyes water! He also had a feel round my neck and declared that everything looked and felt fine. That is a relief as always! As Mr Hughes had said he'd arrange a CT scan this time - he said he'd put that into motion for me - then see me in three months - all being well with the scan. They are so efficient - within a couple of days I'd had the appointment for April and a form for a blood test to be performed before the scan. I just need to wait for the date for that - then pop down the road to Bradwell Hospital to let the vampires do their job. With Mr Hughes not being there - I forgot to ask the questions that my brother had told me to ask. He is Head of Bioinformatics in the Department of Biology at the University of York. I am so happy to know that good research is being done into this. Enough of medical matters. I hope that you all had a good Festive Season. We had a lovely time - it did go quickly being in the middle of the week I was soon back at work! Otherwise we've spent a lot of time lounging around in our Onesies keeping warm and eating too much! This is S a strange book that looks like an old 1940s library book inside a slip case - the pages are foxed and stained and two people have written to each other in the margins all the way through. Also - the pages are packed with loose ephemera, like photos, newspaper cutting, postcards, notes and even a napkin with a map drawn on it. 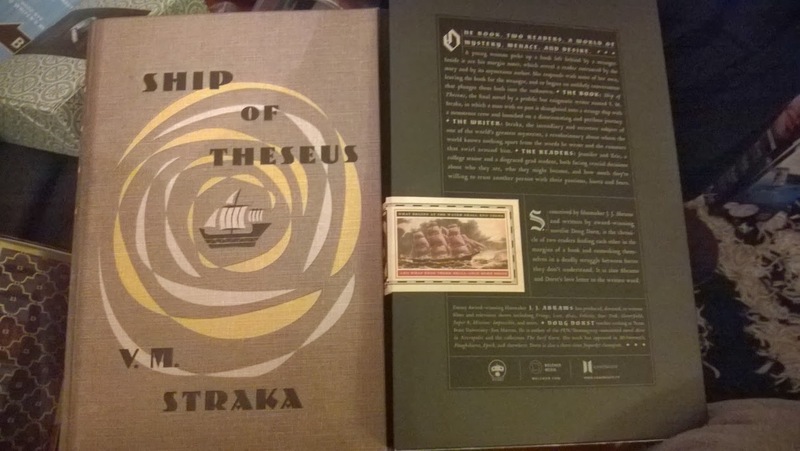 It's a beautiful object and two stories in one book. I haven't decided on the best way to tackle it yet! It was conceived by J J Abrams - the guy who wrote the TV series LOST. it's going to be fun deciphering it! 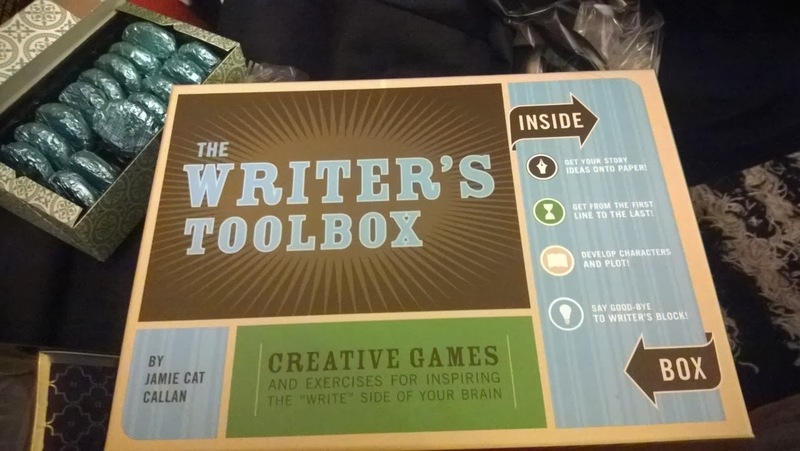 Then there is my Writer's Toolbox - which will give me inspiration for my writing! Hopefully it will get me writing something new this year! There are some fun ways of getting new ideas inside it! 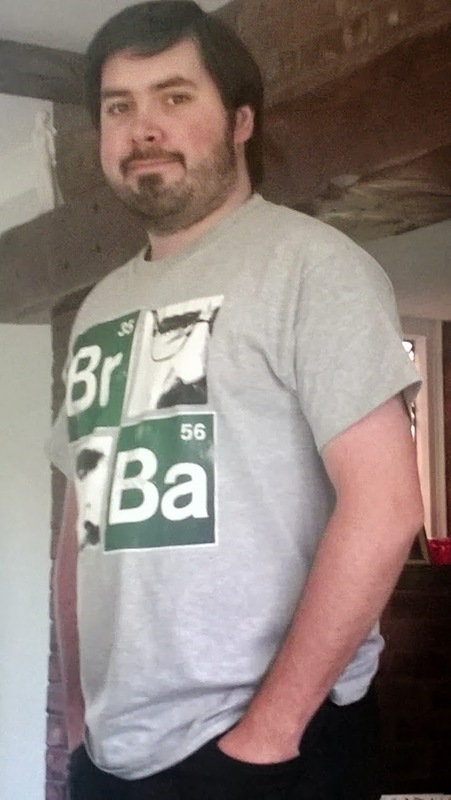 I also had my birthday at the end of the year, which was lovely. I even enjoyed being at work on the day! 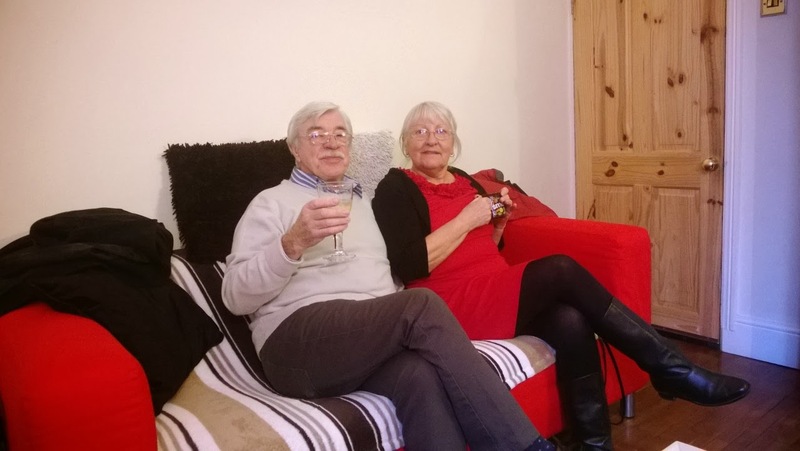 The evening was spent at my parents' New Year's Party as usual. We had some fun new games to try too. 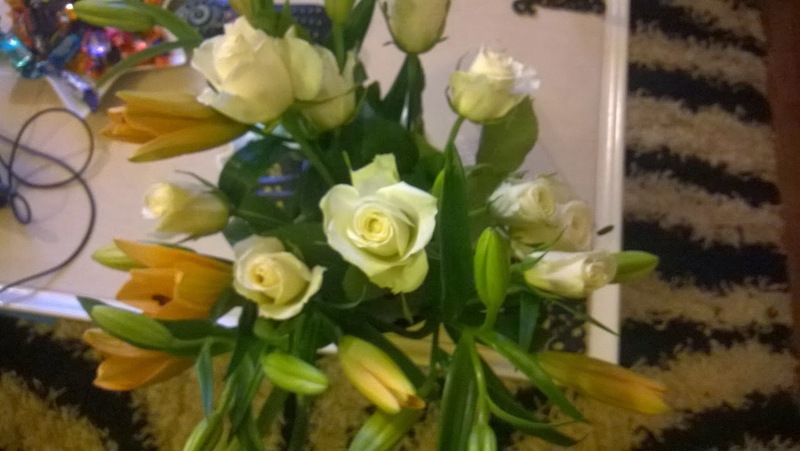 I had some beautiful flowers from Cousin Anne in Chesterfield. Thanks-you!! Today was Nathan's dad's birthday! We had a nice lunch out at Taybarns. I think by now he might have sampled the Jim Beam Honey Liqueur we got him too! So, I wonder what 2014 will bring? I think there are going to be some changes. I will call them opportunities I think :-) The library service is definitely going to change and I feel it might happen quite quickly. We know that the management are looking at the service and how people use it and there will be more emphasis on online services like e-books. downloadable audio books and e-magazines, than on tradition services like books in buildings. If you believe The Sentinel - all branches will close and only the towns like Newcastle and Leek will keep their physical libraries! The County Council have promised to hold consultations with library users and communities to find out what they want from their library service. So who know what will happen? You can't be a luddite about this - you have to keep up with the times and the technology. Public Libraries are slower to embrace it than Academic Libraries - but we are getting there. I do feel like somewhere like Silverdale, which has a high proportion of older users, would be sorely missed in the community. I'm sure there is still room for both! However, my job could change - so I have decided to equip myself with a few more skills. I'm going to learn about making phone apps - in Windows 8 initially. Then I may be of use in the Brave New Library Service - or failing that I can help Nathan in his business! This could be an amazing year! !